Anjali is 11 years old and is in the 5th grade. Her favorite subjects are mathematics, science and Hindi. She has one brother and one sister. Her father was originally from Hardoyi (Utter Pradesh) and moved to Delhi just before Anjali was born. Anjali’s father works as a tailor and earns approx. Rs. 5000/- (92 USD) a month and her mother is a housewife. They pay just for house rent Rs.1000/- (18.20 USD). Anjali and the four other members of her family live in a small one-room house in Sangham Vihar. 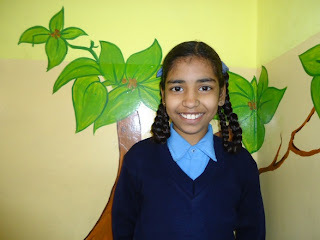 Other students who live nearby Anjali informed her about the Tigri School. She enjoys school and believes that it has given her the opportunity to get a good education. Without HOPE worldwide and the Tigri School Anjeli’s father could not afford to pay for her to have an education. She aspires to be a child doctor.